Considering pleated drapery? Confused about which type of drapery pleats or heading to choose? Those comments usually pique their interest. After many years of working with pleated draperies, I have learned a lot and am always happy to share some insights into the types of pleats in draperies. First, I will describe the more-traditional types of pleated draperies. Pinch pleats: Sometimes called “3 finger pleats,” these traditional pleated draperies have been used for decades. In my experience, it is the most frequently specified type of pleat – perhaps because it is typically the least expensive type of pleat. Three-finger pleated draperies have a large stack-back, and if a client wants a totally open look for the window, the drapery rods need to extend out beyond the window, if there is enough space to mount the brackets for the rod. Otherwise, a different type of pleating must be specified. Euro pleats or French pleats: They are very similar to pinch pleats, with the same functionality and characteristics, except they are tacked at the very top. This type of pleating creates a more modern look than pinch pleats. 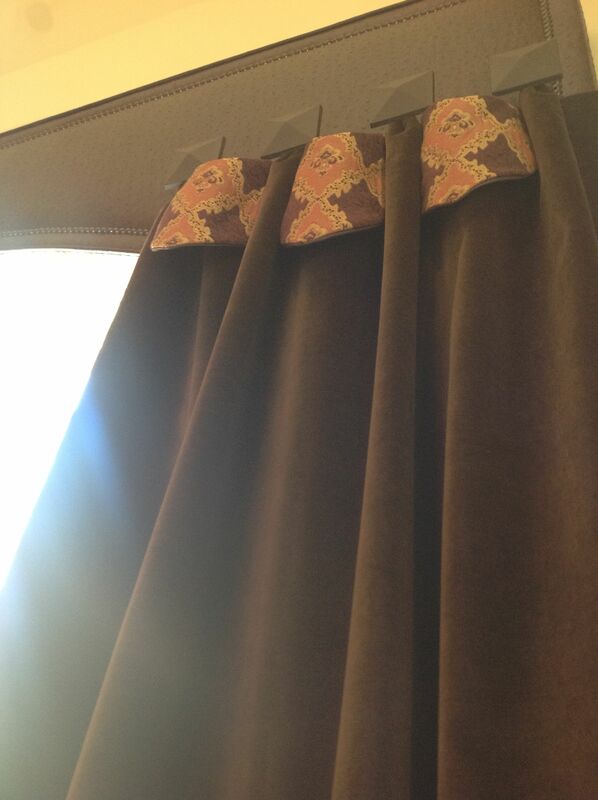 Grommets: Yes, I know grommets can be ho-hum and they are overused (they are quite common in ready-made curtains), but consider the unusual ways that grommets can be used. There are colored grommets, square grommets, ornate grommets and tiny grommets that can tie two pleats together with a contrast cord. These types of grommets present a contemporary look – and the wide variety of colors, shapes and sizes of grommets from which to choose make this type of drapery a great choice when going after a “clean and modern” look. They may be slightly more expensive than other types of draperies, and grommet draperies are not the best choice if you need to cover a large window, because they can be troublesome to open and close. For that reason, they are best if they are stationary. One finger or two finger pleats: These pleated draperies can look so elegant and beautiful – especially on interlined silks or silky fabrics. Box pleats with buttons: Adding one button or a row of buttons in a contrasting color will give the drapery panel a very tailored, sophisticated look. Pleats with added tassels: Again, as with buttons, adding one tassel or a row of tassels will add a touch of formality. And depending on the style of the tassel, we can create either a traditional or contemporary look to complement (or to contrast) the furniture and accessories in the room. Draperies with tabs: They can be very thin tabs or double tabs. They can crisscross each other or they can have buttons. Be creative! Design a little “pop” and have a little fun with your draperies. Ripple folds: Very popular and modern-looking, stacks are small to allow more exposure of the view outside. Ripple fold draperies use less fabric than traditional pinch pleats or French pleats. I love ripple folds because it is easy to add a fun little twist to the draperies by applying a braid trim at the top. Just like that, voila! – a unique look with creative use of trim. Accordia pleats: As the name suggests, these draperies have an accordion-like appearance. Often used in large residential and commercial settings, accordia pleated draperies take considerable time to install because the pleats have to be snapped to the rod one by one. They make a great stage curtains, because of their compact stack. By adding a new twist for your pleated draperies, you are making a creative statement for your windows that contributes to the overall ambiance of your space. We are here to help you create unique window covering that will be perfectly suited to you. For a consultation and a no-obligation estimate, call us at (630) 420-0800 or (630) 854-9082. 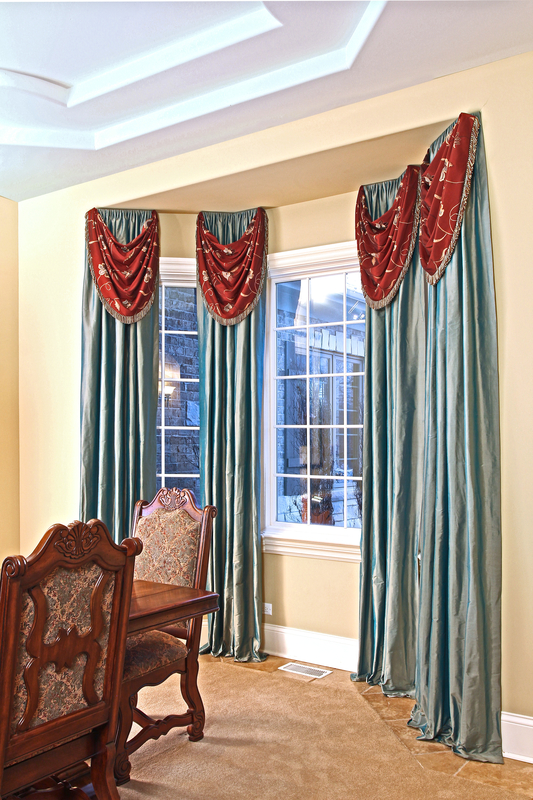 Two finger pleats and modern hardware, make this custom draperies outstanding! 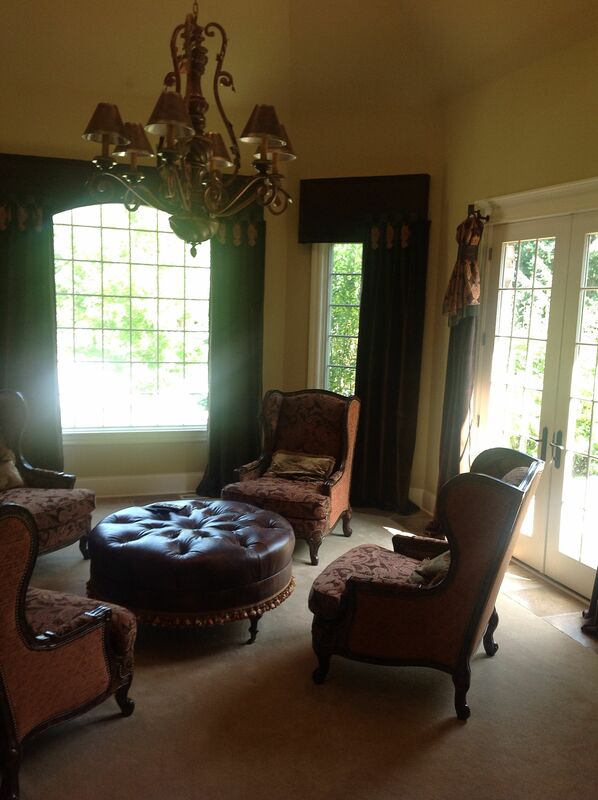 “Piano Room” was the project we created for our client in Plainfield. The teenage daughter plays the piano, and the room needed to be serene and comfortable so the entire family could fully enjoy her performances. The room had walls with a faux finish that was a mix between suede and a pearl texture! Just lovely! It was in a gorgeous neutral color of off white and had a beautiful shimmer to it. The baby grand piano had a glossy black finish. Those were the design elements that I had to work with. The window in the room had a shade with a shimmery fabric, which we had installed two years ago. Now it was time to finish the window with draperies. Three fabrics were selected: At the top, a ten-inch-long section of embroidered cotton in a design of black, grey, off white, and taupe circles. Then we added a three-inch black border. The rest of the panel was striped fabric. Again, we used black, grey, off white, and taupe. When it came to drapery hardware, we selected glossy black to complement the piano. We selected rings and finials that have white diamond-like stones. The wall facing the entry had three framed black-and-white Parisian images, in taupe/silver frames. Two black chairs with white, black and gray printed upholstery were placed on each side of the window. WOW! Even I am impressed that the room turned out as beautiful as it did – and I was there every step of the way. Imagine the client’s delight when people see the room for the first time! Burr Ridge living room gets a new drapery treatment. 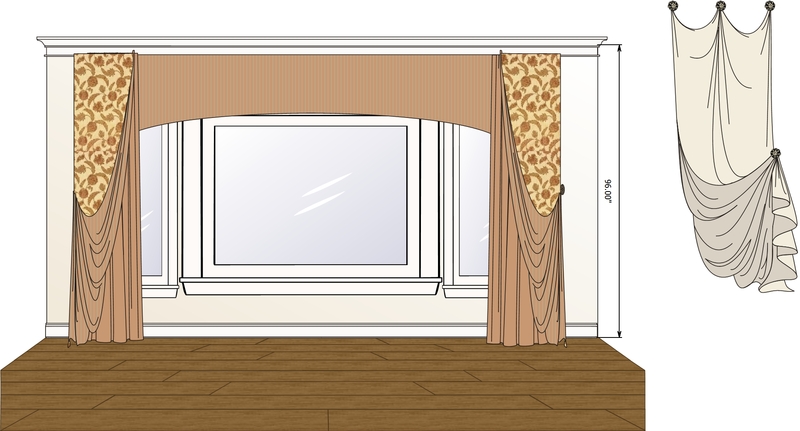 A new drapery design was created for a traditional living room in Burr Ridge Illinois. The inspiration was a tapestry fabric from the Kravet collection, that was the base for the design. The treatment consists of an arched cornice covered in stripe silk fabric, and embellished with a bead fringe from Brimar. The side panels are hung from above the cornice to create height since we had only an eight foot ceiling. The side panels are pulled to the sides to add drama and opulence! 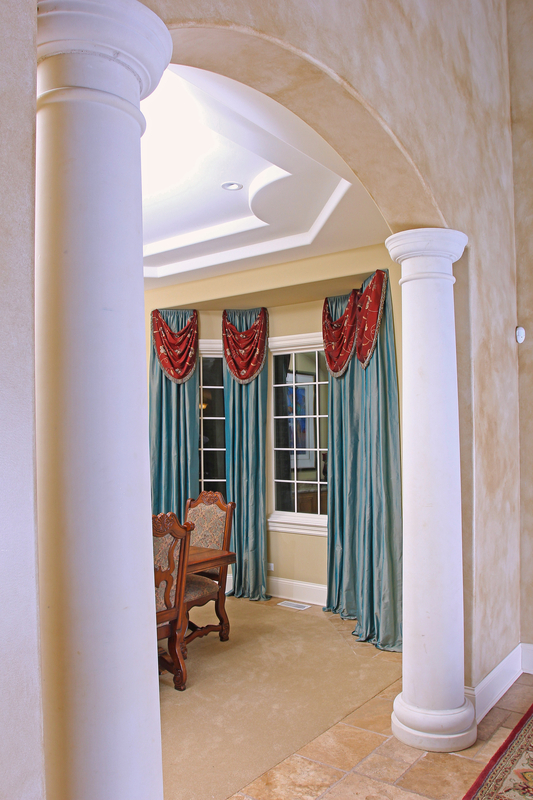 Burr Ridge Draperies for a formal living room. 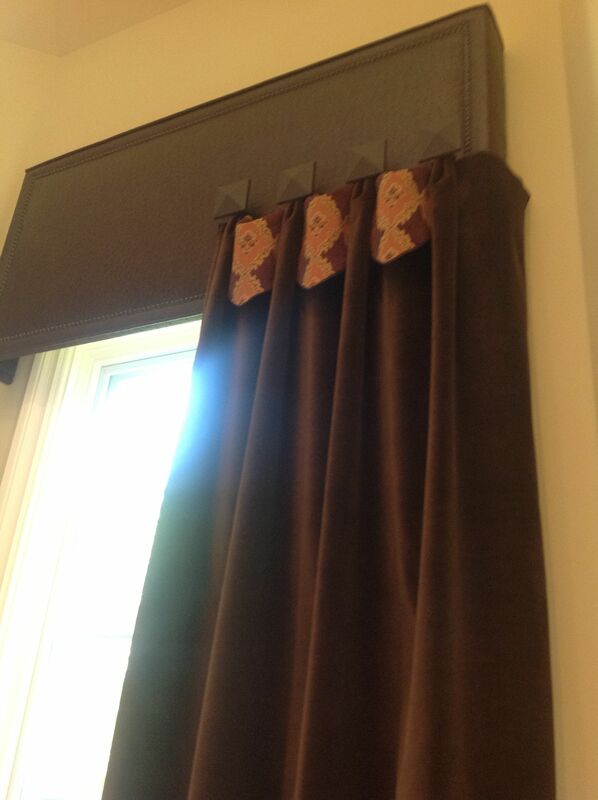 Drapery window treatment for a Burr Ridge Home! The client request for this beautiful dining room was to keep the window as open as possible to let the light in, and to have long drapery panels on each side of the bay window.The home is traditional with many neoclassic features, therefore, the design of the draperies has to compliment the architecture, as well as enhance the window it self. Have silk drapery panels at each corner of the bay, the panels are shirred tight to keep them slim in order to allow the light in and not to block the window. The embroidered fabric used for the swags has tied in the colors of the upholstery on the chairs with the drapery panels. The swags with it’s fringe, the drapery panels and they way they break on the floor, it supports the neoclassic ambiance. For free estimate or consultation call(630)420-0800. 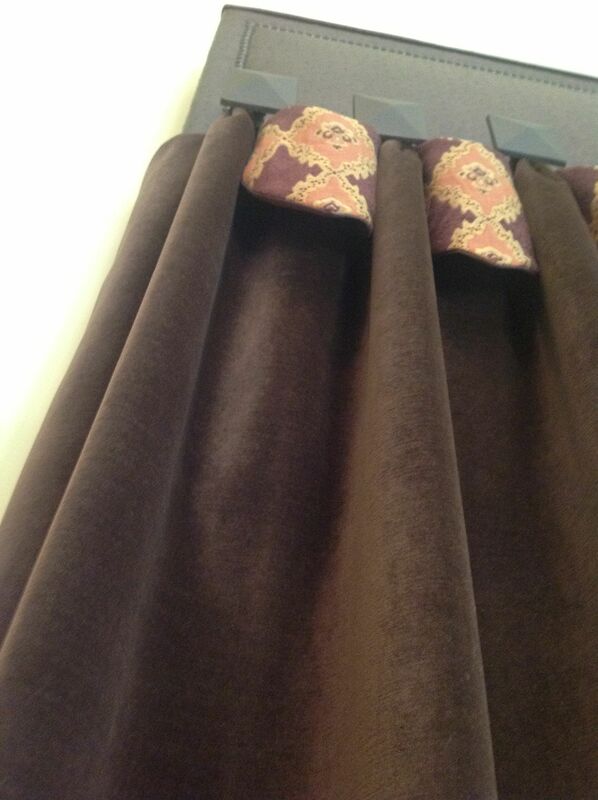 Drapery trims can add elegance and style to your drapery panels! Texture is an important element in your custom drapery design! Texture is often secondary to color and pattern when it comes to the over all design of a space or the window treatment itself in any given room. Colors and patterns usually have and immediate impact, but textures add richness to the colors. For example, the richness of deep colored velvet is due to it’s pile, the shine and iridescent quality of silk reflects it’s smoothness, and the firm weave of cottons helps the printed patterns and colors to come out crisper and stronger. Texture usually describes the way the light plays on the surface of the fabric. That gives a message of how the material feels: its softness, smoothness, warmth, coolness, etc. Textures have their own feel and they evoke special associations. Like chenille might be associated with warmth, cotton with comfort, or silk with being exotic. Varying textures is important and will add interest, sophistication, and style to any space. Imagine velvet pillows with satin trim, tweed drapery panels with a contrast in cotton, or an organdy table runner with lace. Textures might not be the first thing to think about when planing a decorating project or a design for a window treatment, but indeed is a very important design element that need not be neglected! Drapery Panels? How would those window treatments work for you? 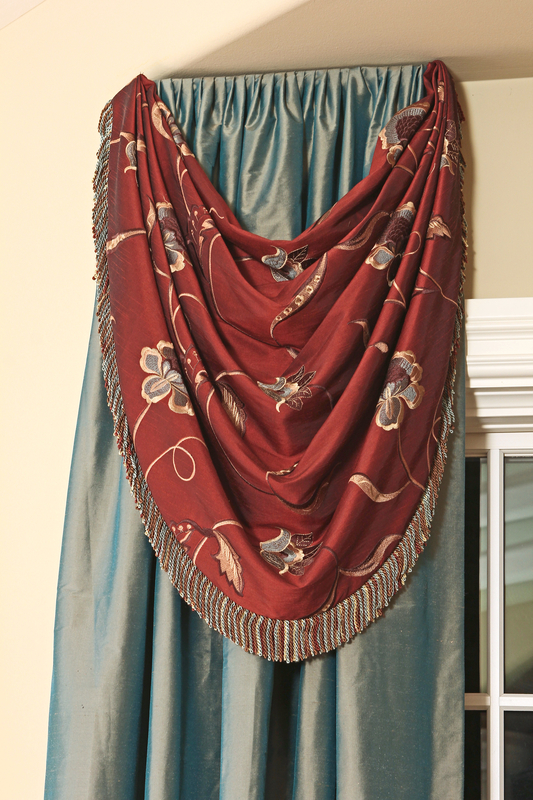 Drapery panels can be gorgeous, elegant, and affordable too! With stationary side panels you can create a beautiful, one of a kind look, and be easy on your wallet as well! How about your ceiling? Is it little low? Create height by taking your panels as high as possible to give the illusion of height. If budget permits, add fringes, trims, tassels, and any embellishments to add beauty, elegance and style. With side panels you can do so much, and create that personal touch that says so much about you! Here is a video of our work showing many panel possibilities!